More than a thousand pounds has been raised at this year’s Osberton International Horse Trials to benefit the work of international working equine charity Brooke. Brooke was recently named the charity beneficiary of this year’s show, when more than 9000 equestrian enthusiasts headed to the Osberton Estate for five days of cross country, showjumping and dressage. Brooke Patron Alastair Stewart hosted the second annual live quiz show ‘EQuestrian of Sport’ in aid of Brooke. Jonty Evans and Harry Meade headed up the teams as they battled it out, testing their equestrian knowledge, for the title of champion. Eventer William Fox-Pitt taking Brooke’s brick challenge at Osberton Horse Trials. 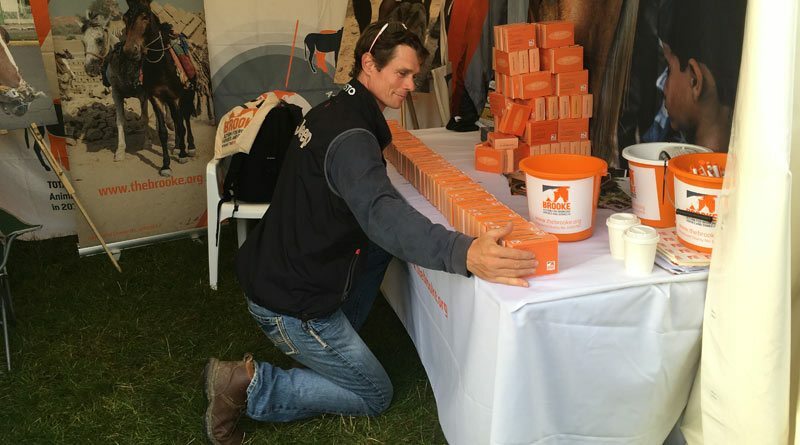 Further celebrity support came from Olympic medal winning eventer William Fox-Pitt, who paid the Brooke team a visit at their stand to take on the Brooke brick challenge – with questionable results! The task highlighted the issue of overloading working animals in developing countries. Horses, donkeys and mules working in brick kilns are expected to pull carts weighing up to 125 stone and make around 13 trips a day with these heavy loads, burning a whopping 53,000 calories. Supporters were asked to channel their inner equine and test how many cardboard Brooke brick collection boxes they could carry in one go. The Brooke stand was also visited by Olympic eventing rider Gemma Tattersall who came to hear more about the charity’s work. She met Brooke staff and helped encourage supporters to take part in the brick box challenge which coincided with Brooke’s current campaign, How The Other Horse Lives, highlighting the stark differences between the daily lives of working equines in the developing world and horses in the UK, looking at the welfare issues that affect both. Brooke also gave visitors the chance to celebrate their relationship with their own horse with their Me and My Horse stand. Guests were invited to pin photos of themselves and their horses on a photo wall which was displayed on the day and will be shared at future events. Brooke specialises in protecting and improving the lives of working horses and donkeys in developing countries, where people rely on those animals to earn a living and support their families. The Brooke cross-country jump at Osberton Horse Trials. Brooke was the charity beneficiary of this year’s event.